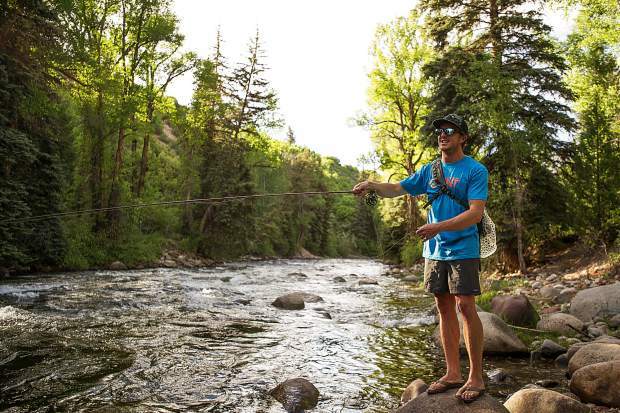 Zach Hayes fly fishes above Jaffee Park on the Roaring Fork River Thursday evening. The meager snowpack will result in lower flows than usual. PITKIN COUNTY — The drought that’s tightening its grip on Colorado’s high country could have numerous effects this summer from “dewatering” the Roaring Fork River through Aspen to preventing Ruedi Reservoir from filling, water experts said Thursday, May 31. Warm, dry weather has essentially gobbled the snowpack below 11,500 feet in the Fryingpan Valley, according to Tim Miller, a hydrologist with the U.S. Bureau of Reclamation who oversees the vast plumbing system that fills Ruedi Reservoir. “There’s really nothing left in the basin,” he said of the snowpack. That’s not unusual this year. The lower- and mid-level snowpack has disappeared in most areas of the state, he said. At this time last year, about 79 percent of the 133 square miles of the Fryingpan River Basin had some level of snow coverage, according to the National Operational Hydrologic Remote Sensing Center. That produced a mean of 10.3 inches of snowwater equivalent — in layman’s terms, the amount of water in the snow. This year, only 51 percent of the terrain in the basin has some level of snow coverage. The mean snow-water equivalent is only 2 inches. “This is a dry year,” Miller said. The numbers are equally bleak for the Roaring Fork River Basin near Aspen. Reduced runoff can have broad implications including low streamflows that affect everything from the health of fish to the quality of whitewater rafting and kayaking. There also will be less water available for irrigation. The dry conditions mean Ruedi probably won’t reach its capacity of 102,000 acre-feet. It’s not all doom and gloom, though. Miller said even in the worst-case scenario, Ruedi will fill to about 96,000 acre-feet, or about 95 percent of capacity. The drought was obviously a hot topic at a recent Colorado River District Roaring Fork Valley State of the River forum in Carbondale. Heather Tattersall-Lewin, watershed action director for Roaring Fork Conservancy, said there are spots in local rivers that create special concerns in low-water years. The Roaring Fork River through Aspen is often “dewatered in dry years.” The city government worked on an agreement to put water from the Wheeler Ditch into the river when it drops to certain levels, she said. The Roaring Fork River also tends to drop to especially low levels just above the confluence with the Fryingpan River in low-water years, Tattersall-Lewin. Pitkin County Healthy Rivers and Streams developed a whitewater park with junior water rights to try to increase the water level in that stretch in lean years, she said. The low runoff prevented the reclamation bureau from dumping a high amount of water from the Ruedi dam into the lower Fryingpan River this spring. “We didn’t see a flushing flow go through the Fryingpan this year,” Tattersall-Lewin said. That could lead to proliferation of a particularly nasty type of algae called didymosphenia geminate but often just referred to as didymo or rock snot. Roaring Fork Conservancy will monitor the presence of the algae. The Crystal River, which often is affected by low flows during the summer, faces a tougher than usual year. The snowpack at McClure Pass was well below average all winter long and melted completely out prior to May 1. Zane Kessler, communications director for the Colorado River District, said snowpack at numerous measuring stations throughout the Colorado mountains have melted out already. Statewide the snowpack is at 30 percent of average, he said. Most of Pitkin County is in the moderate drought classification, the second in five classes. “This isn’t the worst year we’ve seen but it’s far from the best year we’ve seen,” Kessler said.